In a previous essay about the historical implausibilities and authorial inventions in the Gospel Passion narratives, I discussed how the alleged custom of Pontius Pilate releasing a condemned criminal, simply because it was the Passover festival, and pitting Jesus (the son of the father) against Barabbas (whose name means “son of the father”), was a probable case of allegorical fiction in the Gospels. First, we have no outside corroboration that any such custom was practiced by Pilate or by any other Roman prefect governing Judea. As scholar Richard Horsley notes (Oxford Annotated Bible, pg. 1821), “There is no evidence outside of the New Testament of such a custom by Roman governors,” and Pilate, who is “infamous in sources outside of the New Testament for his tough stance, provocations, and violence as Roman governor,” is depicted uncharacteristically here trying to mollify a crowd through extreme leniency and appeasement. Second, the custom is considerably irrational. Can we expect Pilate, a strict and militant Roman governor serving a strict and militant Roman Empire, to seriously release “anyone for whom they asked,” including violent and dangerous insurrectionists, simply because it was a holiday? It would be something like the United States releasing an Al-Qaeda prisoner in occupied Afghanistan simply because it was Ramadan and the people asked for his release. We would realize anywhere else that such a story is implausible. Instead, when confronted with implausible episodes such as this, historians search for a symbolic interpretation of the literary text. It is not difficult to see how the Barabbas story is an allegorical invention. The Gospels emphasize how the Pharisees, Sadducees, and other Jewish groups did not properly recognize Jesus as the messiah. They are depicted rejecting the correct messiah and instead following false messianic concepts. Many Jews were seeking a military messiah and were hoping for the military overthrow of Rome’s occupation. The desire for military revolt culminated in 70 CE with the end of the Jewish Civil War, the destruction of Jerusalem, and the final demolition of the Jewish Temple. The author of Mark, writing around the time of these events, wanted to emphasize that the Israelites had failed to accept their true messiah and earned the consequences. What better way to do this than to have the Jewish leadership favor a false messianic figure who is pitted against Jesus as the true messianic figure? Such a story is presented in the case of Barabbas. Barabbas is specifically identified as a violent military insurrectionist, of the sort who later caused the Jewish revolt. His character serves as a stand in for a military messiah pitted against Jesus, who was the true apocalyptic messiah awaiting a Kingdom of God rather than a military revolt on earth. To further fulfill this role, he is given the name Barabbas, which means “son of the farther,” as he is being pitted against the true son of the father. The literary significance is even further embellished in the Gospel of Matthew, where some manuscripts have the added name “Jesus” Barabbas, where he is literally being pitted against the true Jesus. A further literary dimension is that the otherwise unhistorical custom of releasing a prisoner during a festival parallels another holiday custom that did actually exist. Leviticus 16 discusses the Jewish Yom Kippur sacrifice, where two identical goats were selected each year. One was released into the wild bearing the sins of Israel, and was eventually pushed off a cliff. The other was sacrificed in blood to atone for those sins. Hebrews 8-9 outside of the Gospels already attests to how the early Christians viewed Jesus as the ultimate Yom Kippur sacrifice where Jesus is the atonement for sins. Thus, in this allegory, Mark is telling his readers to reject the sins of violence and rebellion represented though Barabbas and instead to embrace Jesus’ ultimate atonement sacrifice. The historical implausibility of this episode and the clear allegorical symbolism makes it quite clear that it is a mythical element in the Gospels. Nevertheless, apologist William Craig (who is contractually obligated to have to defend conservative interpretations of the Bible) has attempted to defend the historicity of this episode. This essay will rebut one of Craig’s posts on his website about the Barabbas episode. First, an important omission in Craig’s post is that he does not even address the lack of outside corroboration of a custom by Pilate to release any criminal simply because it was the Passover holiday nor does he acknowledge the implausibility of such a custom. Craig instead defends how the unusual name “Barabbas” does not discredit the historicity of the episode. I will address the issue of the name below, but the problems of no outside corroboration and historical implausibility already provide sufficient grounds on their own for rejecting the historicity of this episode. I did find another blog post, however, written by a former Liberty University student, who attempts to argue for a historical context in which Pilate would have such a custom. The author first acknowledges a major problem, “Though, admittedly, there are no extrabiblical references to a release of prisoners at a festival time, there is an account of a release of prisoners.” His solution for extra-biblical accounts of the release of prisoners, however, does not solve the issue of no outside corroboration. The author cites Josephus’ Antiquities (20.9.3), which discusses how the rebellious Sicarii would kidnap scribes and servants of the High Priest and then use them as hostages to ransom the release of their fellow captured Sicarii who were being held prisoner. The High Priest would often acquiesce in these occasional (not customary) incidents, and Josephus even notes how it caused a number of major problems where violent and dangerous criminals were being set free. This was a major problem for when the High Priest was being forced to release such prisoners, and the ruling forces in Judea would hardly make it customary to release such dangerous criminals voluntarily. The author also cites Antiquities 20.9.5, which discusses another isolated incident in which the Roman governor made a display of executing violent criminals before being succeeded by the next governor, but released less dangerous petty criminals after only fining them. This does not adequately explain the release of Barabbas, who is described as a violent criminal of the sort that was executed in this incident, but it furthermore provides no evidence of a regular custom for releasing criminals. Sure, the Romans and High Priest would occasionally release criminals, but there is no evidence or historical context for a regular custom where they would release “anyone for whom they [the crowd] asked,” simply because it was a holiday. Such a custom would be far more implausible. The author also cites some examples of Pilate’s early bloodthirsty behavior as the Roman prefect, when he put down some Jewish uprisings, and claims that he might have released prisoners to later soften the political tensions. Yet, this is far too ad hoc. For one, Pilate is depicted as being bloodthirsty by all other sources, so this would at least be uncharacteristic behavior. But furthermore, it certainly does not entail that he would create a custom for regularly releasing any prisoner on a holiday. Barabbas was acknowledged to be a violent revolutionary of the sort that should be in prison. If anything, Pilate may have in a few instances released some of the less dangerous prisoners (as the other examples show Roman governors occasionally did), but this is hardly evidence of establishing a custom of the sort in Mark 15. Accordingly, we have no outside corroboration of the alleged custom of Pilate in Mark 15, and its historical implausibility already provides sufficient grounds for doubting the episode’s historicity. First, Craig provides a couple examples where the name “Barabbas” is attested elsewhere to argue that it is not an unusual name. However, this hardly entails that the character is historical, simply because the name is not uncommon. A frequent misconception I have observed among apologists is the assumption that common names can’t belong to invented allegorical characters, but this is clearly false. As I discuss in my essay, “Allegorical Characters with Common Names in the Alexander Romance and the Gospels,” there are fictional characters attested in other Hellenistic literature who have common names like “Nicolaus” and “Lysias,” which also belonged to real persons (see, for example, the Athenian orator Lysias). Nevertheless, these characters are still fictional, and their names are in fact even more common than a name like “Barabbas.” Hence, an invented character can have a common name that still conveys allegorical significance. Craig next provides an example in the Third Jewish Revolt (132-5 CE), where the leading insurrectionist was named Bar Kochba, which means “Son of the Star.” But this only provides evidence that such names could be provided as cognomens. It does not mean that an allegorical character could not likewise have such a cognomen when described in similar circumstances. Again, attesting to historical uses of a name does nothing to undermine allegorical uses of a name. Craig also claims that, because the passage says that Barabbas had committed violence during “the” insurrection with the definite article, the audience was expected to know a specific insurrection Mark is referring to. But, once more, this is flimsy evidence. The Gospel of Mark was written half a century later to a Greek-speaking audience outside of Palestine, and the author of Mark does not provide the details of any specific insurrection. Instead, since the Jewish Civil War had recently just occurred (or was in the process of occurring, assuming the mainstream dating of Mark at c. 67-75 CE), “the” revolt could be little more than an indication of “the” Jewish proclivity towards violent resistance, which had culminated recently in the Jewish Civil War (which eventually culminated in the destruction of Jerusalem). Craig’s next argument for the embarrassment (and hence historicity under the criterion of embarrassment) of attaching the name “Jesus” to Barabbas is likewise very frail: “it would be highly unlikely that Christians would lend the name of the Lord Jesus to a sinful criminal; more likely that they would suppress it!” I see no reason at all for why this would be unlikely. Because Jesus is the same name as their messiah? The name “Jesus” or “Joshua” was not an uncommon Jewish name and could apply to villain or hero alike. For example, the name “Jesus” is applied to the father of a sorcerer and false prophet in Acts 13:6-8. Moreover, by naming him “Jesus Barabbas” the passage further emphasizes how Jesus, the true messiah and son of the father, is getting pitted against another Jesus, the son of the father, who is a false messiah. Again, the passage parallels the identical goats at the Yom Kippur sacrifice. What would be the odds of two men with the same names being pitted against each other in perfect allegorical symmetry in a custom that otherwise has no outside corroboration? It would be quite small as a historical coincidence, but would make perfect sense as a fictional invention. Next, Craig claims that the Barabbas “is part of the pre-Markan passion story and therefore very early and is independently attested by John (Jn 18.40).” This claim is likewise full of assumptions. First, it is not even established that there was a pre-Markan Passion story. John Crossan and a number of other leading NT scholars in The Passion in Mark have argued based on thematic, stylistic, lexical, and redactional studies that no pre-Markan source may have existed for the Passion narrative in Mark. Furthermore, Craig is being extremely careless in his speculative quellenforschung in assuming that he can discern a specific character and episode from an otherwise unknown and unconfirmed previous source. And furthermore, even if there was a pre-Markan Passion story, the author of this earlier source could have invented Barabbas for the same reason as the author of Mark. Simply moving the invention back to an earlier source does nothing to establish its historicity. His claim about independent attestation in the Gospel of John likewise falls flat. The assumption that John was unaware of Mark and the other Synoptic Gospels is usually based on the dubious reasoning that the author does not quote the ipsissima verba of the earlier accounts. But a number of similar themes and episodes, such as the Passion narrative, indicate that the author was probably familiar with these earlier texts. In fact, Louis Ruprecht in This Tragic Gospel has even done an extensive study about how John’s Passion narrative is written in direct response to Mark’s Passion. Craig’s final argument is that the Yom Kippur sacrifice was practiced at a separate time than the Passover festival. So what? Mark couldn’t use the symbolism of the Yom Kippur festival elsewhere? Likewise, the early Christians saw the Yom Kippur and Passover events as being merged through Jesus’ death. There is no reason that the clear allegory could not be carried over to the Passover. Craig also claims, “Moreover, the sins of the people were symbolically laid on the scapegoat, which was then driven out into the wilderness. 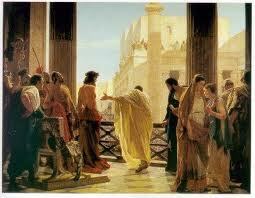 That interpretation of the Barabbas incident would make Barabbas, not Jesus, the one who bears our sins! Thus, it would be utterly inept theologically to invent the Barabbas story on this basis.” For starters, the goat that was sacrificed was the one meant as the atonement of sins, which is why Jesus is the one executed. The other goat bore the sins and was shunned, which Barabbas in bearing the sins of violence and rebellion is meant to represent. Craig’s interpretation is the one that is theologically inept. So every bit of the Barabbas episode can be explained as mythical allegory. The custom described is not attested by any outside source and is historically implausible. The parallelism of the names, where Jesus, the true son of the father, is pitted against Barabbas, the false son of the father, is unlikely as historical coincidence but perfectly probable as authorial invention. The addition of the name “Jesus Barabbas” in later texts strengthens the parallel. The episode likewise merges the symbolism of the Passover and the Yom Kippur sacrifice beautifully, as the church father and theologian Origen astutely recognized. We have a clear case of ahistorical myth serving as allegory, which suggests that the Gospel authors probably invented other characters and episodes for similar literary purposes. This does not befit the writing of historical prose, but it is perfectly common in the genre of hagiographical prose novels (I discuss the similar use of such allegorical characters in the Alexander Romance, here), which is more likely the literary genre to which the Gospels belong. This entry was posted in Apologists, Exegesis, History and tagged Barabbas and Yom Kippur, Barabbas the Son of the Father, Gospel Mythology, Richard Carrier, William Craig, Yom Kippur Sacrifice. Bookmark the permalink. according to the nt, people believed ancient people could appear in the face of people contemporary to them. in the nt, jesus is not recognised. is there a possibility that the people who were preaching a different jesus from paul weren’t preaching a crucified jesus? is there a possibility that jesus going into hiding and then appearing to his deciples later on got morphed into ressurection ? if we assume a historical jesus then is there a possibility that he appeared alive and well and told his deciples that the jews spread bull s hit about him being crucified? now why would a post ressurected jesus remain in hiding? it makes better sense for him to remain in hiding if he escaped crucifixion. this is all speculation but the gospel accounts do seem like they changed something into a ressurection. This comment is technically in violation of my comment’s policy in the first section dealing with relevance to the article. Richard2013, those are some nice observations you caught about the Gospel Narrative (GOSPAN). Many theologies & hero stories have collided within them to produce OH SO MANY QUESTIONS FAITH-HEADS! (grin). One thing I read somewhere, maybe Bart Ehrman, maybe Richard carrier, is that, if Jesus had commited some religious “crime” the pharisees could have had him stoned to death with mo intervention from Pilate. If he had been considered an insurrectionist, then Pilate would have captured and tried him himself, with no need for the pharisees. So there isn’t really any part of the story that holds up.